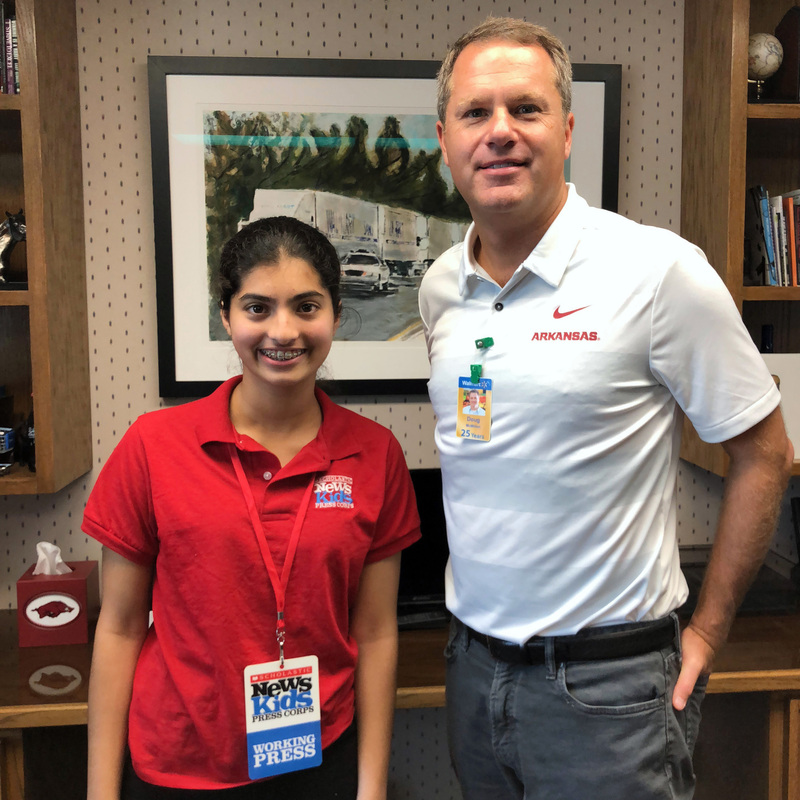 Walmart CEO Leads by Example | Kid Reporters' Notebook | Scholastic Inc.
With more than 2.3 million employees, Walmart is the world’s largest employer. Founded in 1962 by Sam Walton, the company is headquartered in its original location: Bentonville, Arkansas. The first store to bear the Walton name, Walton’s 5&10, is still open today and serves as a museum. I recently visited Bentonville to attend Walmart’s quarterly Saturday morning meeting and talk with Doug McMillon, the company’s president and chief executive officer. We discussed the changing face of retail, the Walmart culture, and what it takes to be a good leader. The Saturday morning meeting was Sam Walton’s idea to discuss strategy for the upcoming week and make sure that everything was in place for the weekend, which is the biggest selling time for retailers. It is now a chance to celebrate the company’s employees. The meeting I attended recognized associates who had been at Walmart for more than 20 years, truck drivers who had driven billions of miles, and the Walmart customers who were raising money for Children’s Miracle Network Hospitals. The meeting speaks to Walmart’s culture of optimism. Michael Phelps, the most decorated Olympic swimmer in history with 28 medals, and Rob Lowe, an actor and director, attended the meeting and spoke about their current projects. The event also spotlighted the work of Glenn Stucki, a Walmart associate and author of My Smile Is My Superpower. As an 11-year-old, Stucki suffered a traumatic brain injury. Today, he is the co-founder of Change4Love and paints pictures of superheroes for struggling kids. McMillon led the meeting, personally congratulating each honoree. At age 52, he is the youngest person to be the chief executive officer of Walmart since founder Sam Walton. Like Walton, McMillon has roots in Arkansas. Growing up in Bentonville, his first job was as a Walmart summer associate. He unloaded trucks and later served as an assistant manager at a Walmart in Tulsa, Oklahoma. Today, McMillon is leading Walmart into a new era, as an increasing number of consumers shop online. Innovations are tested at the Walmart stores in Bentonville. During my visit, I saw a pickup tower for quick in-store pickup, robots that inventory stock, robots that scrub floors, and self-checkout hand scanners. By creating a connected ecosystem of technology, Walmart hopes to free up more time for the store associates so that they can improve the customer experience. What are some of the principles that led to Walmart to become a global company? There are four themes in the behaviors that Sam Walton practiced. The first is respect for the individual—caring about each person that works for the company; embracing inclusion, and supporting the individual. The second is striving for excellence, and having really high expectations. Even today, the expectations for this company are extraordinarily high. Good is not good enough. Third is serving the customer, trying to do everything for them and putting them first. Last, acting with integrity and doing the right thing. We’re in several countries, and we try to explain what we mean by doing the right thing in a way that’s relevant in China or relevant in India or here in the United States. We have this 10-foot rule here in the U.S. If you see a customer within 10 feet, you should look at them in the eye, smile, say hello, engage them in a conversation, and say thank you when they leave the store. What do you do to make sure that the culture stays in place? The most important thing that a leader can do is to behave consistently with the words that they use. Talking about our values matters, trying to live them matters even more. For example, there were associates visiting from around the world for the Saturday morning meeting today, so I stayed behind to talk with everyone who wanted to talk with me. That's just one example of how we can try to put actions behind our words. As online shopping becomes more popular, what are you doing to make sure that people still enjoy coming to the store? We want to serve them however they want to shop. So if they want to shop online only, that’s fine with us. We have a very big e-commerce business through Walmart.com, Jet.com, Sam’s Club, Shoes.com, Bonobos, Hayneedle, Moosejaw, etc. So we have a big e-commerce business, but we also are excited about the future of stores. We’re investing in our stores to make it a better experience. What we’re finding is that people want both. I just think about what I need and where am I at that moment, and I shop in the most convenient way. I think that’s how customers will increasingly shop in the future. What are you doing to keep up with the changing retail space? We like a challenge and the history of Walmart includes a lot of change. So we’re kind of built for it. We’re trying to embrace change and get out in front of it. The biggest areas of change are related to technology and data and how we actually re-engineer our way of working. We are moving to a more agile way of working, kind of like a tech startup. Within our stores, we’re making sure that we’re moving with enough speed, delivering what customers expect from us, and innovating for them. The meeting shared success stories featuring Michael Phelps and others. Why is that important? We like to celebrate the hard work that our people put into delivering for customers. Recognition is really important and what you celebrate is typically what you get. So part of what we’re doing is sending a message about what we care about. So when we celebrate someone like Glenn at the end of the meeting today for the way that he lifts up his fellow associates and inspires people in the way that he serves customers, it’s because we would like to have a lot more people like Glenn. What can kids do to become a leader? One step at a time. You’re learning and growing. I’m learning and growing every bit as much today as I did when I started. When I was younger, I had this impression that you go to school to learn the things that you need to learn and then you go to work and apply them. It’s not really like that. I would encourage people to realize that really what they want to do is to form great habits. Habits about how they learn and absorb new information and apply it in your life because in the future, problem-solving skills, resilience, and overcoming obstacles are going to be really important characteristics. Yes, math, science, and the ability to read and comprehend information are all important. But working cross-functionally to solve problems you face at that moment will be a critical skill. What role does failure play in your success? We’ve had a long history of failure. We’ve opened store formats that didn’t work. We’ve gone to countries and failed, and it’s just part of it. It’s like a human being falling down and getting back up. The way you overcome that, your attitude, what you’ll do next, not dwelling on it, and making it OK to take a risk and fail. Culturally, it’s really important. Otherwise, people play it safe, and playing it safe results in the classic decline. The curve of birth, growth, and decline will repeat unless you change.